SamuiBus.com | Book Airport transfer to Bang Rak just a few minutes! 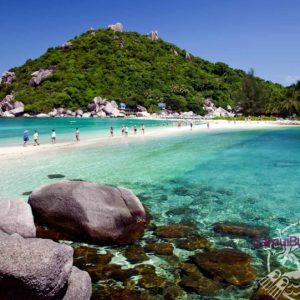 Bang Rak Beach is located in the northeast of Samui and has smooth sand, good swimming preferences and is safe for children. From here you have fantastic views over the 12 meter high golden Big Buddha and the neighboring island of Koh Phangan. BangRak (Big Buddha) Beach has everything to offer like restaurants, bars and shopping opportunities and all kind of accommodations from simple beach huts to tropical resorts catering to all budgets. The nightlife of Chaweng is just a 10 minutes drive away and daily boats to Koh Phangan and the monthly Full Moon Party are leaving from here. Get from the Koh Samui airport to the hotel in Bang Rak and back will be so easy if you will think about it in advance. All you need is to book the Transfer service.